If you see Trotux.com every time you open your browsers, it means that you are dealing with a browser hijacker. Although browser hijackers are not harmful on their own, they are quite bothersome and they do lower your online safety level. The main symptom of the hijacker is that it changes your browser settings without your approval. Other symptoms include adverts, redirects, tracking cookies, and more. The hijacker affects all popular web browsers, so if you wish to get rid of its symptoms, you will have to delete Trotux.com completely. You may not remember installing Trotux.com, because it uses other freeware to access computer systems. It spreads in free software bundles and often is added by the users without them even realizing it. In order to avoid similar programs in the future, you need to make sure that you choose the Advanced mode and pay attention to every step of the installation wizard when installing free third party software. 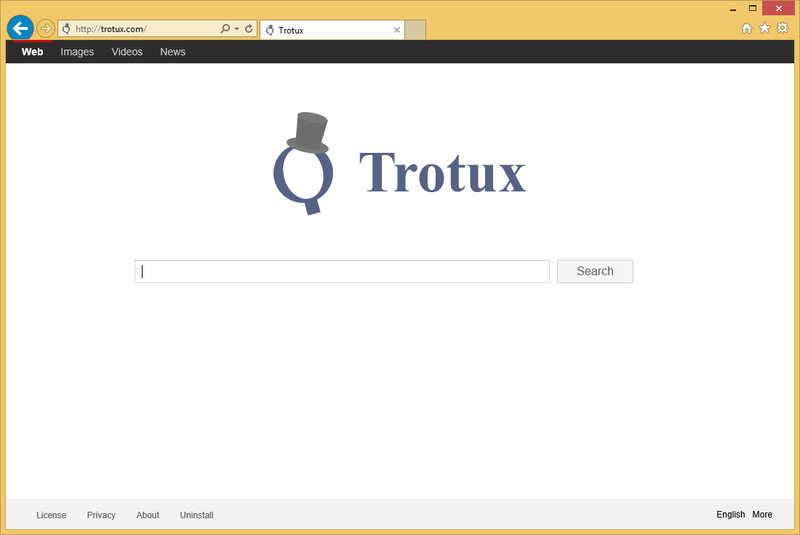 Once the hijacker takes over, it replaces your home page and default search provider with Trotux.com. This site contains a search box and a fake ad. Interacting with the page is not something we would recommend as the search box will present you with results that have sponsored links that may be unreliable as well. In general, various ads will appear on your visited sites at all times. It is important that you know that these ads are not endorsed by the hijacker, so you click on them at your own risk. If you do not wish to accidentally infect your PC, waste your money on fake products, or fall for some other scam, you should avoid all ads for now. If you wish to eliminate the adverts and other annoying symptoms of the hijacker, you should terminate Trotux.com right away. You can erase Trotux.com from your browsers manually by deleting its related software and restoring your browser preferences. We have prepared instructions in the manual Trotux.com removal guide below the article. You are welcome to use them, should you choose to go with this option. The more reliable way to go, however, would be to use a malware removal tool and eliminate Trotux.com automatically. You can download the utility from our website. It will scan and clean your system. The anti-malware will not only help you get rid of Trotux.com, but it will also safeguard your computer from future infections you may encounter on the Internet.